Location: Paradox, Paradox Lake, Adirondack Mountains, New York, USA (90 Minutest North of Albany. 1 Hour from Lake Placid. 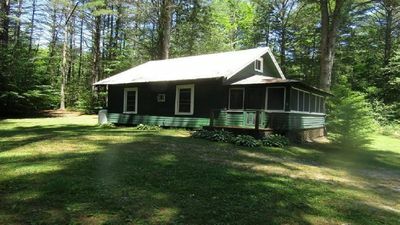 This rare Gem is a private family retreat located on Paradox Lake in the heart of the Adirondacks. 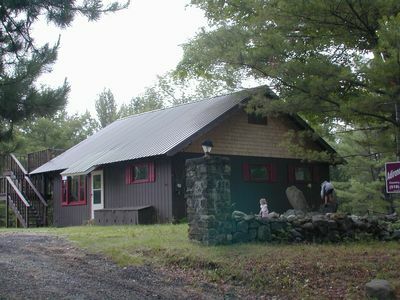 Built in the tradition of the Adirondack Great Camps, but with a modern interpretation, the house sits at the end of a private road. 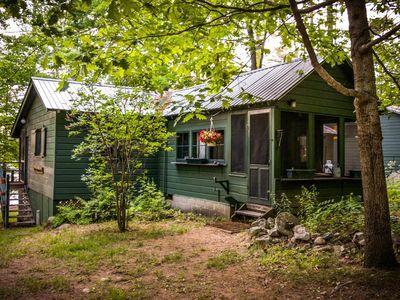 The Camp offers comfort, natural and architectural beauty, and a wide variety of outdoor activities year-round. 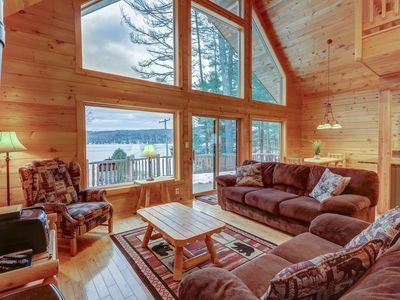 Large windows throughout the house make the home bright and allow Spectacular views. The heart of the home is a large central great room that contains the living, dining and kitchen spaces. 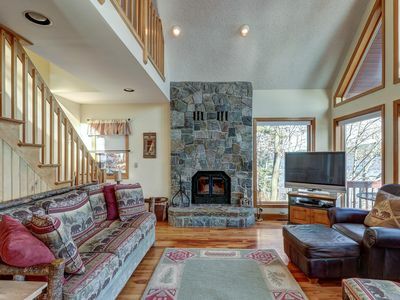 It has a stone fire place and exposed trusses that extend beautifully across this area. 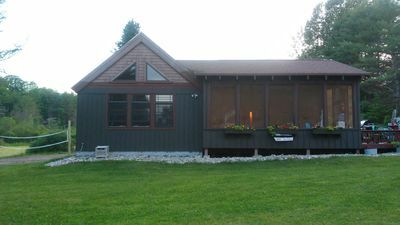 The living, dining and kitchen areas feature large picture windows with views of the lake, beach and lawn. 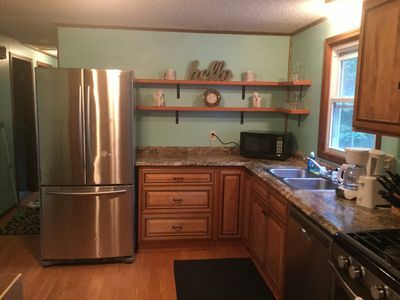 The kitchen is fully outfitted for a chef..
A large screen porch with Mahogany floors allow ample room for breezy indoor-outdoor living and entertaining. 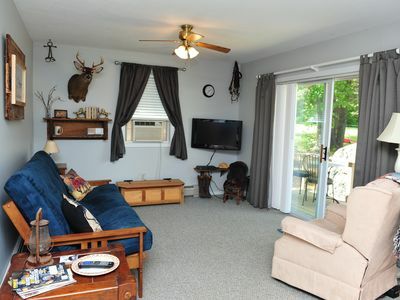 The porch also has a dart board, a 9 foot pool table and is the perfect place to spend a lazy summer afternoon. There is an outdoor cement ping pong table and a full sandy volleyball court for the competitive at heart. 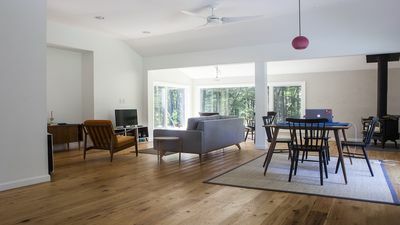 The use of natural materials throughout the house, including stone, wood, and glass, combined with modern finishes, high ceilings, and ample spaces gives the house a light and airy feeling. 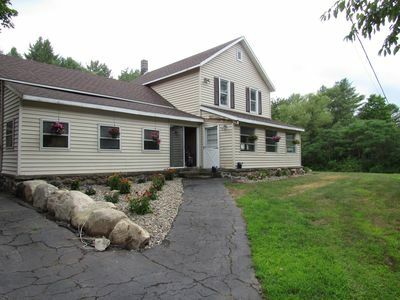 The home has three bedrooms and a loft, and can comfortably accommodate a 6-8. This home sits just steps from the beach. 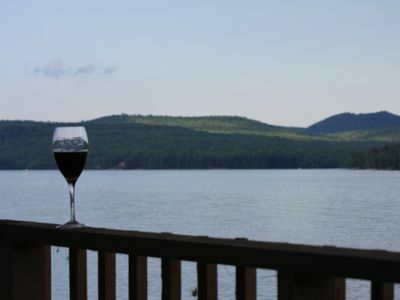 Relax on the screened-in porch which overlooks Paradox Lake as you listen to the calls of the loon, watch a blue heron take off and an occasional eagle fly over the bay. Swim out to the raft and gaze out onto the lake. 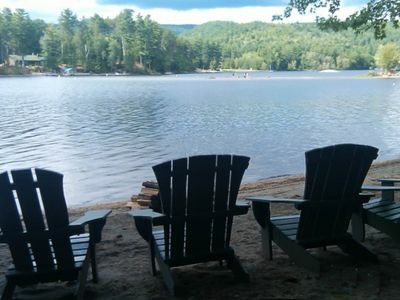 Sit on the sandy beach in an Adirondack chair. You will not be disappointed! 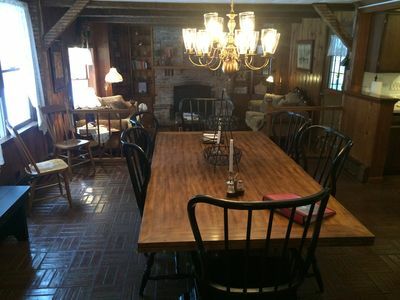 The house sits at the end of our private dead end road offering quiet privacy. 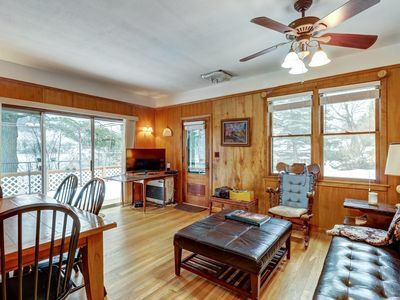 The property boasts a large sandy walk out beach and plenty of safe sheltered room for swimmers. Paradox Lake is one of the jewels of the Adirondacks, known for its clean water, natural beauty, wildlife and great fishing. The 3.8 mile long lake is large enough to allow for all forms of water activities but also small enough to offer peace and tranquility. 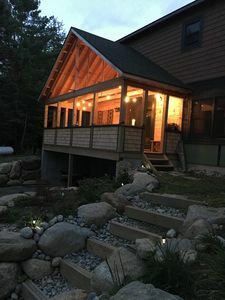 Just 3 tenths of a mile off the Northway (87) This beautiful Camp is ideally located and easily accessible throughout most of the year and is in close proximity to the high peaks, Lake Placid, Whiteface Mountain, Lake George, Gore Mountain, and Vermont. 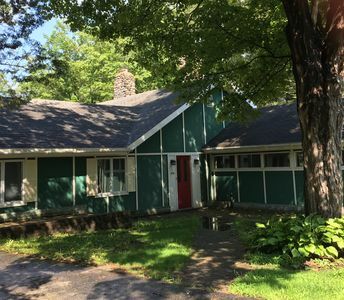 It sits four hours north of New York City and 90 minutes north of Albany and provides a perfect getaway, refuge and base of operations during all seasons. 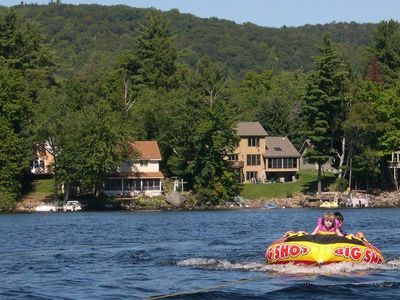 Golfing: Schroon Lake Municipal Golf Course with a nine-hole course and Ticonderoga Country Club, open to the Public with a 18-hole course. Boating/Fishing: Bring your own boat for fishing salmon, trout, pike, and bass. Concerts and Movies: Seagle Music Colony, Strand Theater, and Aviation Mall Theater in Glens Falls and the Saratoga Performing Arts Center and of course the Saratoga Race Tracks are all nearby. Amusement Parks - North Pole, Magic Forest, and Great Escape are minutes away. 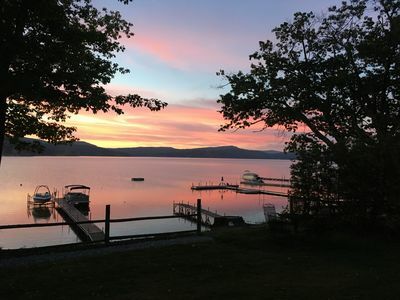 Other Activities: Dinner Theater; Horse Racing available at the Saratoga Race Track, which is open late July through Labor Day; Sea Plane rides every Thursday. 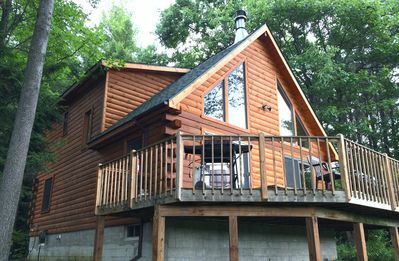 Comfortable all season lake house! 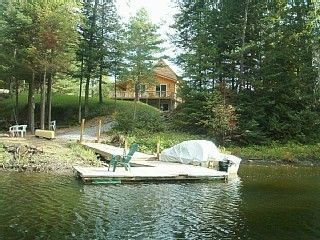 Lakefront home w/ deck facing the water - great for beach sports & families! 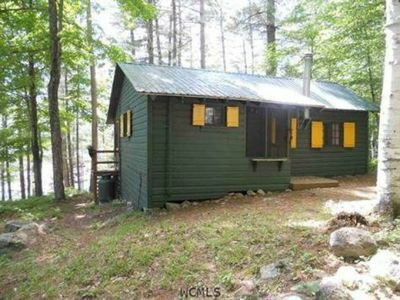 Spacious chalet with tons of room & shared beach/dock!